If you are eligible enough for the schools of your preferred. Whether you want to re-attempt the test. How to access GMAT Score? Note: In circumstances when the candidate has no longer access to the email with the link. They can contact the GMAT Customer Service for help. The official GMAT Score Report details each of the sectional score and the individual percentile ranking. The percentile ranking changes to certain extent each year as it based on all the test takers for the past 3 years. In any case, the GMAT score Scale is static and stays steady with no change. Official GMAT score reports are available to the test taker and his or her designated score-report recipients (schools) approximately three weeks after the test date. The most recent AWA essay response. Helpful background information for each candidate such as country of citizenship and GPA. Computerized photograph taken at the test center. Self-reported background information, such as phone number, undergraduate institution, grade point average (GPA), and planned graduate review. Once proper deliberation has been done, the candidate has to follow these steps to choose the 5 GMAT Score Recipients. 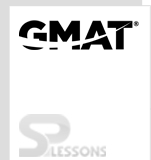 Step 1: Go to the official site of GMAT. Step 2: Click on “The GMAT Exam” head. Step 4: Click on ‘Your Score Report’. Step 5: Click on ‘Send you Scores to School’. Step 6: Select the ‘Send your GMAT Score’ button. Step 7: You will be directed to this page where you have to enter the following details to log in into your account. Step 8: In the account you can choose the 5 schools or institutes where to send the GMAT Scores. Apart from the 5 Score Reports that can be sent to the schools picked by the candidate, they can order extra GMAT Score reports by paying an extra fee. Once the GMAT score is accessible, the additional GMAT Score Reports will be sent within 7 days. But for the non-US Test Takers, it might take longer than the usual period of delivery. The test taker can also obtain a duplicate GMAT Test Report for himself/herself by reaching the GMAT Customer Service. Click on the ‘Contact us’ option at the end of the home page.